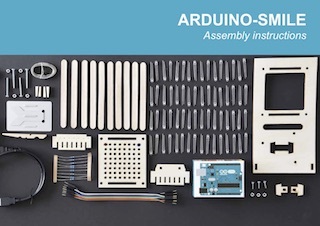 Starting with ‘Arduino Smile‘, our first Arduino based assembly kit, we aim to stimulate creativity by donating IoT themed kits to schools. PAY IoT FORWARD is an industry-led project to support schools in stimulating integration of technology into education, especially focused on transcending the physical and digital worlds. New technology enriches our lives offering seemingly unlimited possibilities to build and create and yet they are often perceived as alternative; not real or augmented, but a virtual reality, or an iPad instead of a book, a digital note pad instead of pen and paper, etc. PAY IoT FORWARD aims to break down these walls and help students develop the insights in how the internet and digital technology, and who see digital devices adding value to all aspects of our lives. This box contains all components to assemble an Arduino powered 8×8 LED display, including solder iron and illustrated assembly instructions. It is designed to support schools in helping students entering the world of internet of things and digital technology. Value of the box we donate is about CHF 50,- You are kindly invited to sponsor a school, or purchase a box (buy one, donate one). Contact us for more information.